2017 Publix Campaign: Behind the Ask – Publix Super Markets, Inc. When asked why he is so passionate about fundraising for UF Health Shands Children’s Hospital, Publix cashier Aaron’s response was simple, yet profound. “Shands saved my life,” he stated, as he fought back emotions. 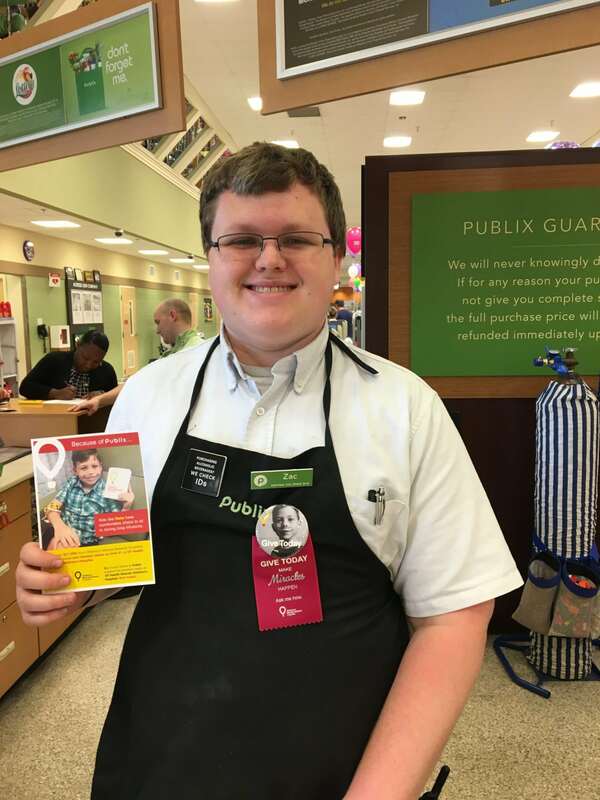 As an employee at the Publix in Lake Harris in Leesburg, Florida, Aaron is one of the top sellers of the Miracle Coupon that is being offered to customers through July 1 in exchange for a donation to their local Children’s Miracle Network Hospitals. For over 25 years, Publix cashiers like Aaron have been making miracles for UF Health Shands Children’s Hospital by asking for donations at the register. 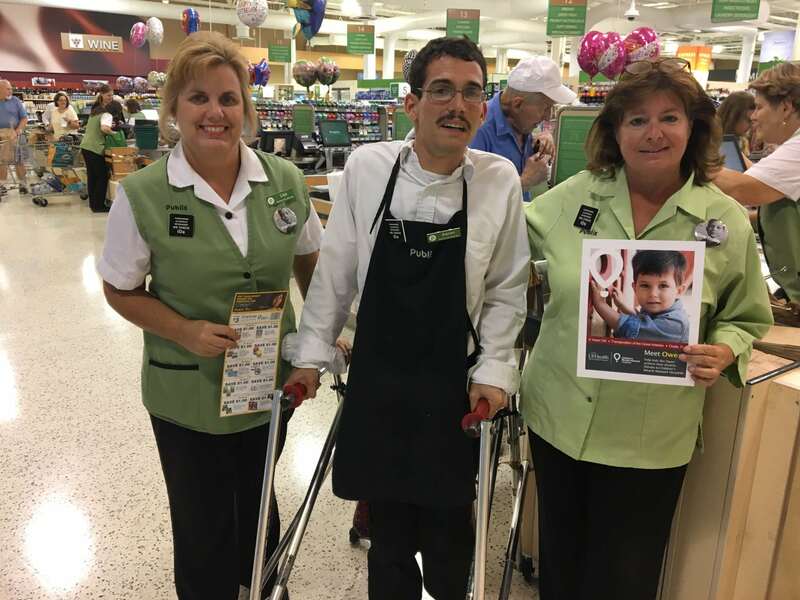 Top fundraiser Aaron with two fellow employees at their Publix in Leesburg. Zac, who has been a Publix employee for several years, was 18 years old when treated at UF Health Shands Children’s Hospital. “I had cranio pharyngioma and spent about 2 and a half weeks there. The Publix campaign with Children’s Miracle Network Hospitals means hope for kids. It really shows these kids that people in the community care,” said Zac, who works in Customer Service at the Butler Plaza West Publix in Gainesville. Zac, a Publix employee at Butler Plaza West, is passionate about the campaign because he knows what it is like to be in the hospital as a teenager. 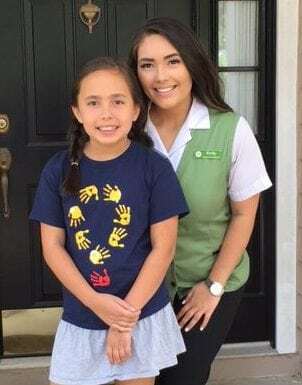 Megan, an employee from the The Shops at Foxwood Publix in Ocala has been connected to the cause of Children’s Miracle Network Hospitals since her college years. As a student at the University of Florida, Megan participated in Dance Marathon at UF, which also raises funds and awareness for UF Health Shands Children’s Hospital. 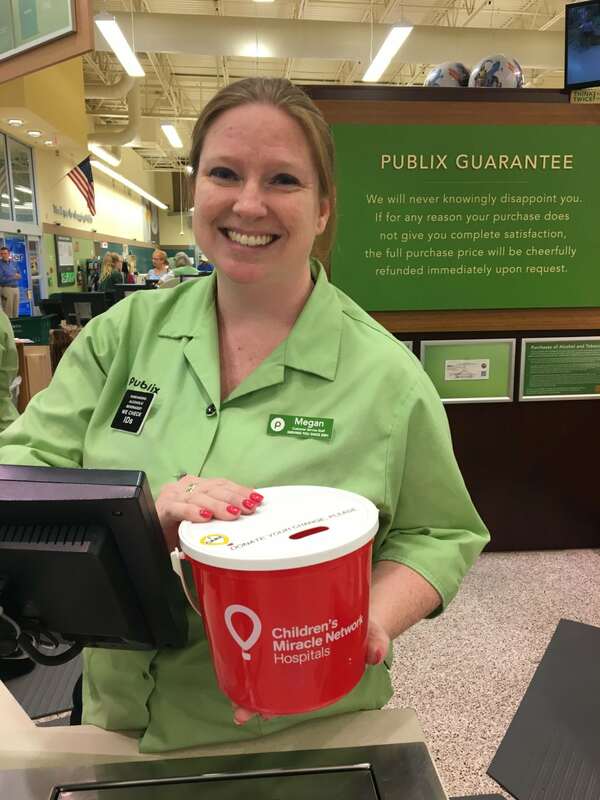 She later became even more connected to CMN after her own son started receiving care there, making her even more passionate about raising funds at her local Publix. The funds raised during the 3-week Publix campaign are ensuring that the 150,000 children who are treated at UF Health Shands Children’s Hospital, including Megan’s son, receive the best care possible. Megan is a Publix employee and a former Dance Marathon at UF participant. The Hunter’s Crossing Publix in Gainesville has rallied around one of their own employee’s connection to bring awareness to the campaign. Emily Chapman, who has been with Publix for almost 3 years, was in her senior year of high school when she suddenly found her whole life turned upside down. Emily suffered from a C4-C6 spinal cord injury from a rollercoaster. “The injury left me paralyzed from the neck down for a week and I had to relearn how to do everyday tasks such as walking and writing. With the help of the staff at Shand’s, I was able to get back to full function,” said Emily. The Chapman family received an incredible amount of support from their Publix location after Emily’s accident. “We never expected this from a store we shop at regularly,” said Lisa Chapman, Emily’s mom. Publix employee Emily with her sister and CMN Ambassador, Elie. Since the partnership began, Publix has raised $7,658,198 for UF Health Shands Children’s Hospital. In 2016 alone, the long-standing partner raised over $780,000 for local kids. To learn more about the Publix campaign and other ways corporate partners are supporting UF Health Shands Children’s Hospital this summer, visit giving.ufhealth.org. Previous post: Buying Groceries at Publix Can Save Lives!